Be The First To Review This Greenhouse! The Compact line of greenhouses is perfect for the serious gardener who insists on the best quality at an affordable price. 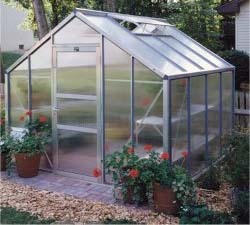 If you are an avid gardener looking to start more of your own flowers and vegetables, these greenhouses provide ample space for all your endeavors. If you enjoy tropical trees and plants, the well insulated Compact series is an excellent choice for extending the growing season! Whether you want to grow right into the floor of the greenhouse or prefer to grow in containers, the options are endless with the Juliana Compact series.